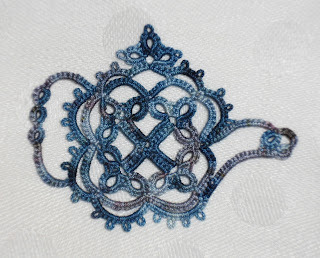 I finally got around to purchasing Martha Ess's Tea is for Tatting book. I had seen many examples of her pretty teapots on various blogs and kept telling myself I'd get her book some day. Well the day is now! The thread is Karey Solomon's Upper Atmosphere. Cool weather is upon us. This means it's time to get the knitting out. Last winter I only got so far as casting on and knitting just a few rows of my next knitting project which is something I had wanted to knit for a loooooooong time. It is Alice Starmore's Flora jacket. Every time I saw a photo of this jacket, I thought I wanted to knit it someday. Last year, I finally treated myself and bought the wools. Now I shall be torn between tatting and knitting! But aren't the colours looking amazing? I just had to show you. The knitting is absolutely wonderful-you'll enjoy this project! Very strange that your search box is not working. I just tried it for kicks, typed in wool, and up popped the post about your wonderful little milk cap pin cushions. Mine sits right next to me with my favorite tatting tools! 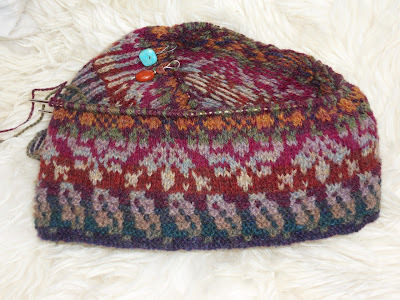 I love Alice Starmore's patterns, and some day I will try one. I have two of her books, and they are wonderful for inspiration. I hesitate to try a sweater. Somehow, mine never turn out the size they should! Hi Diane, you were too quick! I just updated my blogpost because after writing it, I searched on the web and solved the problem. So the new search bar at the top does work! About sizing in knitting, I have to tell you that I learned that lesson the hard way and now make swatches! I knitted a whole Fair Isle vest for my husband which turned out too small because I hadn't taken the time to knit a swatch to find out that I need to get a size smaller needle to the one stated to get the same tension. I was crushed. All that knitting time and he never wore it. But yes, Alice Starmore's designs are gorgeous - I just love her colour combinations. What a beautiful piece of knitting, that jacket will be a stunner! Gorgeous color way in the teapot! Alice Starmore! I am impressed! You are obviously as accomplished a knitter as you are a tatter, if capable of her powerful designs. The hat is smashing! And so, I might add, are your stitch markers! Oh - beautiful Karey SOlomon colourway. Just beautiful. Beautiful tea pot, I also keep seeing these teapots, must put the book on my wish list. Lovely colours for a jacket. Alice Starmore's patterns are stunning. Love the colours you're using. I'll have to dig out my book by Starmore. Maybe I'll knit one with you.